To empower under-served youth and families in Washington, DC with the love of Christ. To develop their God-given potential spiritually, socially, and intellectually through academics, life skills, the arts, and discipleship. Khaulysha, pictured above, is an incredible example of the successes of this ministry -- you can watch a video featuring her story at the end of this post! 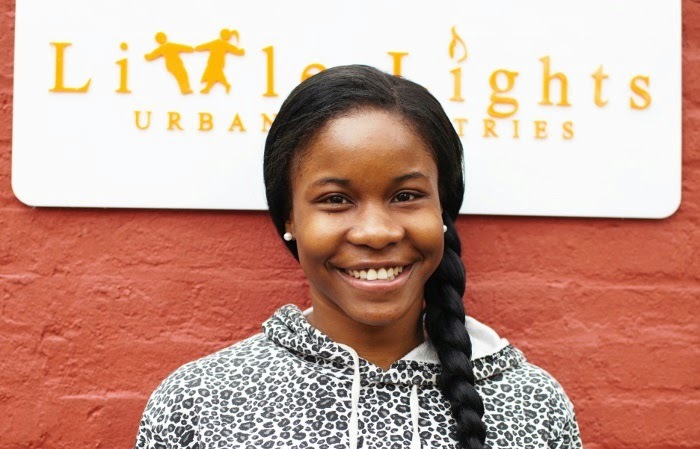 Little Lights offers tutoring, mentoring, and a Saturday drop in program from children (DiP). This is the program Mark and I first began volunteering with in 2009. DiP quickly became the highlight and most thought-provoking aspect of our weekends. We gathered with friends to pack bagged lunches -- the children at Potomac Gardens qualify for school lunch, we were told on the weekends lunch might simply not be an option for their families. During their time at DiP, the kids were given one on one attention from adults, a chance to do crafts, play arcade games, read books, and even have computer time. But more than anything, the kids asked for lunch, often as soon as they walked in the door. Before it was time to leave, they always asked if they could have another bag to bring home. Experiencing this once kept us coming again, month after month. Little Lights has expanded their work to include a choir, professional training for the parents of the children they serve, coordinating diaper drives and even started an employment program called the Clean Green Team. This past year, they were also able to expand into an additional housing facility in the neighborhood. Most recently, my involvement with Little Lights has been to serve on their host committee for their annual benefit. Through this role, I learned the most startling fact about Little Lights. In order to quality to live in Potomac Gardens, a family of four must have an annual income of about $9,000 or less. That means they have little more than $40 per person, per week. This about your grocery budget, the cost of diapers, even a new school uniform shirt (many DC public schools have uniforms). I have known for years that the need was great, but that figure, $9k annually, is what has motivated me more than ever to support Little Lights and spread the word. So why am I telling you all about Little Lights? Well, for a number of reasons. I believe it is important to be involved and connected to the community where you live. The church we attend has the tagline, inwardly growing, outwardly serving -- a heart for loving DC, not just using this city as a pit stop on a career trajectory. My love for DC has grown during our 7 years living here, and so has my awareness of this city's needs. In addition, the longer I am part of online communities like The Influence Network and She Reads Truth, the more firmly I believe that God is using the internet in big, bold ways to reach and serve his people. So today I ask you, will you join me in supporting those in need right here in my neighborhood? Will you spread the word about Little Lights? Will you consider giving $24 dollars today, June 19th, to support Little Lights in their fundraising campaign, Do More 24? Awesome post! And great point about caring for vs. using DC. wow, what a well-written description of how we need to care for our community (and how this ministry is doing just that!). as a philly girl, i've always had a heart for urban ministry and am currently applying to be a teacher at schools that really need Jesus' hope. thanks for this encouragement!